The new multi-gym Bowflex HVT combines strength training and cardio training in one of the quickest, most effective workouts. 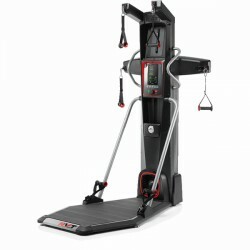 In just 18 minutes and 20 seconds, the Hybrid Velocity Trainer offers a whole body training, whereby fat is burned and muscles are built at the same time. Being a worldwide established brand for fitness, Bowflex is represented with the multi-gym Xtreme 2SE in our range of products. 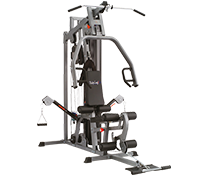 The Xtreme 2SE is a compact but very flexible multi-gym. The Xtreme is equipped with a patented resistance system and does not need any classic weight stack. The bars/springs of this multi-gym are connected at the backside according to the desired weight. Due to this system, the multi-gym is very silent and offers a dynamic training movement - the wider the movement is done, the bigger gets the resistance. The resistance is at 60% at the beginning of the training and increases progressively to 100%. Depending upon the transmission, a resistance of up to 186 kg is possible.